Love Nikki-Dress UP Queen has millions of players all over the world. In Love Nikki you have the Stylist Arena, which you can find at the top left of your home screen. In the stylist arena you have the option to battle other players. You battle them by dressing up in a specific theme. The winner of the stylist arena season will obtain diamonds, gold and starlight coins. So winning these contests is quite useful to obtain additional resources in the game. However, there are many people who are unsure of exactly how this works exactly. Therefore we’ll give you all the information you’ll ever need about the stylist arena in today’s post. In the stylist arena you get 5 challenge attempt for free every day. You have the option to buy more attempts by using diamonds (if you need more diamonds check out our post on Love Nikki Cheats). Winning the challenge will award you with 5 starlight coins and points. Losing the challenge will give you 3 starlight coins but you will lose points. Every monday the season ends and you’ll receive rewards depending on your rank and grade. The higher you place, the better your rewards will be. Every time the season comes to an end every contestant’s level is decreased by 1. There are 5 grades in the Stylist’s Arena. We’ll list them from low to high. The higher your grade is at the end of the season the more rewards you will receive. As we’ve mentioned, you will receive more rewards the higher your grade is. Use the following table to figure out exactly what rewards you will receive at each rank. The top 20 of each week will also receive additional rewards. However, reaching the top 20 is extremely hard. In the Arena you have certain attributes that you should incorporate in your outfit. However, not all these attributes are equal. 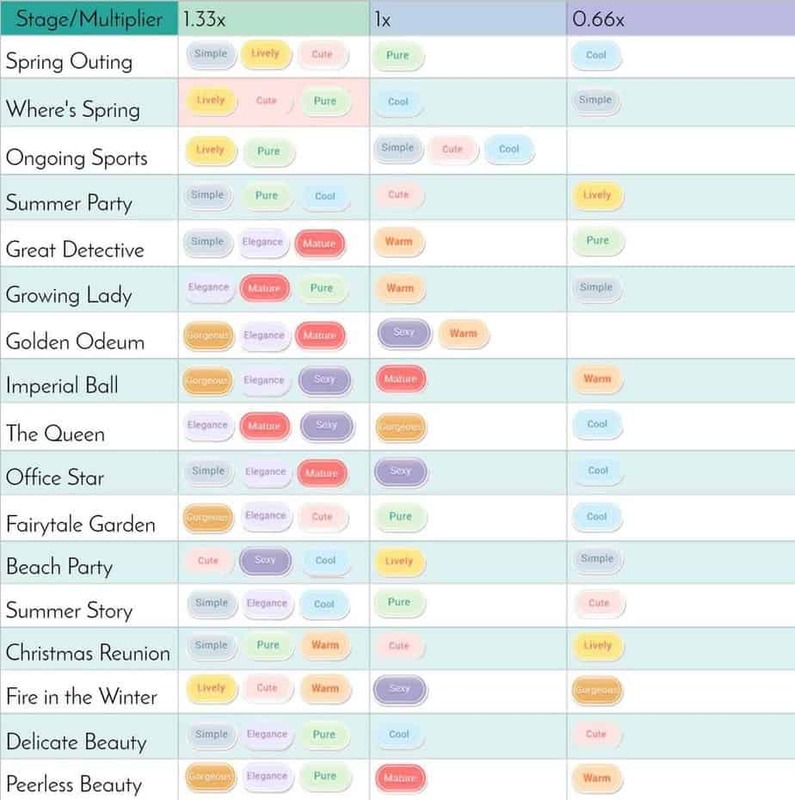 For example, did you know that the Spring Outing has a 1.33x multiplier for the simple, lively and cute attribute? You can check out all the multiplier values in the following chart that I found on reddit. Since the rewards get better the higher you place it’s important to win the challenges. But this is easier said than done. The following tips might give you an edge in winning the stylist arena. In order to win you should take advantage of Momo’s predictions to see the score of your opponent. The score is not 100% accurate but gives you a good idea of what to aim for. It might also be a good idea to write down your top score for every time so you can know whether you can beat an opponent or not. You can load your best scoring outfit by pressing the “best score” button. Using the “exchange for one” button allows you to swap your opponent for a new one. Use this when you think you’re unable to beat your current opponent. If you’ve managed to obtain a new item and want to experiment with it to see how well it will do in the arena it’s generally a good idea to test it out on an opponent with a score that’s a lot lower than yours. This allows you to safely test your new item to see how it will perform. If you want to obtain a high rank, it’s pretty much a given that you will need to buy attempts. These attempts can cost quite a few diamonds so be prepared to spend them on attempts if you’re aiming for high ranks. VIP Players can purchase more attempts.